Gabriel Gonzalez is a young man with many skills and a passion for green design and reuse. He has plans to graduate with a degree in Adpative Reuse from Fairhaven College at Western Washington University in Bellingham in the fall of 2010. He also has worked for the salvage and deconstruction crews at The RE Store from 2008-2010. His work has given him an opportunity to have regular access to a good selection of used materials and he has made the most of them. The kitchen was created from the ground up. He found a used refrigerator and stove, butcher block, the faucet and the cabinets. Gabriel completely remodeled a heavily outdated and partially unfinished building that he owns, turning it into a warm and inviting little 2 bedroom cottage. 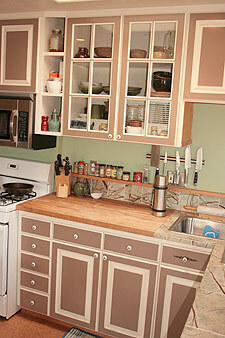 He gutted the bathroom and kitchen, and transformed the entire place with over 80 percent all used materials. All of the windows were used. The window sills, door and window casings, and the base molding throughout the house was made from quality fascia boards that he helped salvage from a house on Highland Drive in Bellingham. 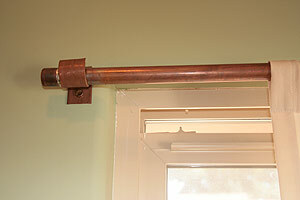 Curtain rods were made from copper pipe and brackets and the list goes on. 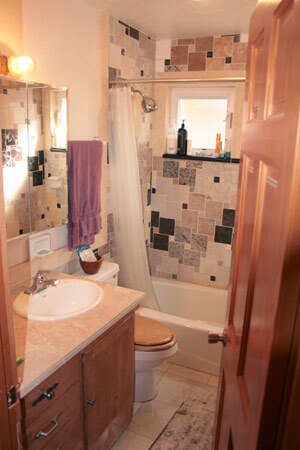 His used materials list for the bathroom included: the tub and toilet, vanity, sink & faucet, tile, lighting fixtures, door and a mirror from a house he helped salvage from on Whidbey Island. The 2×4 studs were from the green demolition deconstruction of a house that Gonzalez worked on at a Kickerville Road site. Everything in the bathroom was used, except for the paint and heater vent cover. He rebuilt the existing wall heater and found a refurbished water heater and used cutoff scraps of bathroom-grade drywall from a big-box retailer. Not content to have an ordinary bathroom, he customized the tile to his own liking. With the project complete, Gabriel now gets to enjoy the beautiful and functional spaces on a daily basis.